When I first ventured into the realm of essential oils, I was introduced to “cedar” oil. I found the odor unpleasant and stayed away from it. That is until I discovered that what some people called Cedar oil wasn’t distilled from a true cedar. That oil is from Virginian Cedar, or Juniperus virginiana. 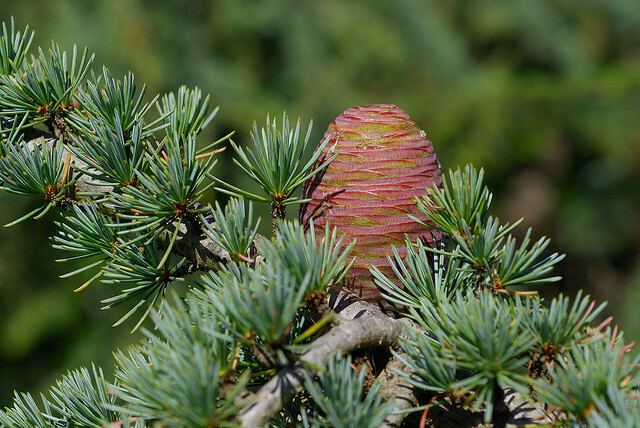 A true cedarwood oil comes from Atlas cedar (Cedrus atlantica), or its relative the Himalayan cedar (Cedrus deodara), and smells divine. Atlas cedar does smell woodsy, as ‘cedars’ do, but whereas Virginian cedar oil smells like pencils the Atlas smells sweet and balsamic. I went from disliking “cedar” oil (of the juniper variety) to falling in love with Atlas cedar. And, I soon learned, there are other “cedar” oils out there that are really Thujas and are in the Cypress family. “Cedar and cypress trees resemble each other. However, they are two distinct kinds of trees that are not very closely related. … Many trees that are called cedars actually refer to mixed assortment of genera that are scattered throughout the families of Pinidae. ‘True’ cedars of the genus Cedrus are located in the family Pinaceae.” It may seem complicated, but it helped me to understand how I could adore the scent of one oil and hate another when they both were called cedars. It is important to understand that all “cedar” oils are not the same in their chemical makeup either. Thuja oil, also called White cedar or Red cedar, can be very toxic due to its namesake constituent called thujone. This component can be responsible for damage to the nervous system and can cause convulsions. It is best to avoid Thuja oils in aromatherapy. Virginian cedar and True cedars are often used for respiratory or urinary infections and stress-related disorders. The beautiful and much nicer-smelling True cedars can also be helpful for skin conditions such as acne, dandruff, dermatitis, and eczema. And, I find that Atlas cedar enhances meditation by inducing deep breathing, making it soothing and leading to feelings of being grounded. My adoration of Atlas cedarwood inspired me to include it in my first perfume blend along with blood orange and rose otto. I wore it one night when I was going out on a first date. The gentleman picked me up at my door and led me to his car. When he let us both in and shut the door the scent of the perfume became more pronounced. My date looked over at me as a cat looks at cream and said, “Gee, you smell good.” I was proud and a little nervous. So, remember that all cedars are not the same. Your nose can lead you to similar types (Atlas and Himalayan smell deliciously similar) but knowing the Latin name can ensure that you purchase a cedar that is for your intended use.